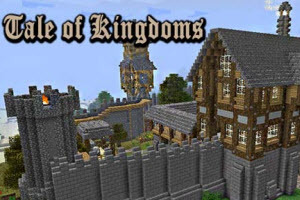 Tale of Kingdoms is a mod for Minecraft, the popular world-building survival game. Instead of exploring the usual rolling landscape populated by creepers, skeletons and livestock, you can become a king in a medieval world, fighting evil creatures as you struggle to build your own city — a tiny kingdom ruled by you! One major new feature that sets Tale of Kingdoms apart from the vanilla game is the NPCs or non-player characters that you'll meet. The Guild Master is the central character of the game: talk to him to sign a monster-hunting contract or hire other NPCs, called hunters, to help you out. Other characters include the Inn Keeper, who will let you relax in his establishment to pass the time until morning, the Black Smith, who will sell you weapons and armor, and the Chef, who sells food. Getting started in Tale of Kingdoms is as easy as it is exciting. After making a new world in Minecraft and clicking the “Start Your Conquest!” button, you’ll find yourself on a gravel path leading to the local inn. You’ll meet the Guild Master here, sign the contract and go out to destroy evil, racking up honor points as you lay waste to your foes. Once you’ve accumulated enough honor to prove yourself worthy of the crown, you can return to the inn and talk to the City Builder, another friendly NPC who will follow you to the place where you want to build your new kingdom. Collect resources and chat with the fellow, giving him orders to construct buildings and create a mighty city for you to rule!